I didn't know if it were possible to get kids' films like this anymore. It was great fun from start to finish, it's (possibly) about 15 minutes too long (the middle section drags a tiny bit), but it's so enjoyable and there are excellent quips throughout. My kids went away quoting the jokes from the film, and that must be a good sign.I read another review that director Joe Cornish was a big fan of Time Bandits Terry Gilliam's 1981 fantasy movie. Both have strong leads, slightly oblique plots, together with wizardry and magicTime Bandits had Sean Connery, The Kid Who Would Be King has Patrick Stewart who puts in a sterling alternating performance (with Angus Imrie) as Merlin.Louis Ashbourne Serkis is fabulous as Alex the main protagonist. He's got an acting pedigree (both his parents, Andy Serkis and Lorraine Ashbourne) are excellent actors. His Dad is best known for his portrayal of Gollum...fancy having a Dad who was Gollum? !Anyway, TKWWBK is terrific. As a teenager I loved Excalibur but it's too long (and dark) for my 10 and 11 year olds. This was a perfect antidote. Arthurian Legend and heraldry but without (too much) bloodthirstiness.Go and see it, it's the best film (whether aimed at children or adults) I've seen for months and months. My 11yo absolutely loved this movie, as did I. Pretty sure my 14yo would find it boring and lame.....Joe Cornish has captured the spirit of classic English 20thC fantasy (Narnia, Bedknobs+Broomsticks, Dark Is Rising etc) wonderfully, and brought it into the modern era. It's by no means perfect, but if you just suspend your disbelief willingly this film has enormous charm, excitement, magic and humour. (Could the kids really train to take on an army of undead warriors that quickly?? No, of course not. Now shut up, hold your child's hand and Eat Your Popcorn),Nice to see Tintagel again, although the scenes shot in North Cornwall were over too quickly for me. 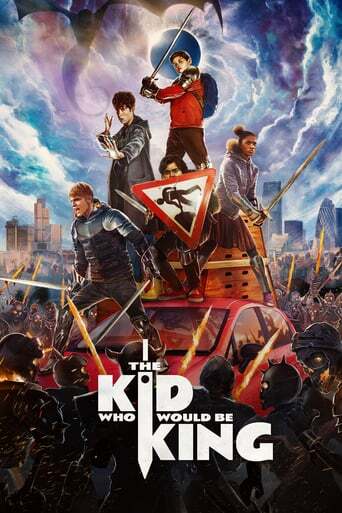 Downloading Seeding The Kid Who Would Be King (2019) [WEBRip] [720p] [YTS.AM] from to 0 peers.